There’s a large and active group among students of the American Civil War fascinated with the service of Irishmen in the conflict, and with the Irish Brigade of the Army of the Potomac in particular. There’s a vast amount of lore and legend on the subject, which I’ve only really noted in passing. I know … and with my surname, too. So it is with some trepidation that I dig here into the life and passing of Patrick Phelan (Felan) Clooney. One of those heroes of the Irish Brigade at Antietam. Clooney was apparently well known about his native County Waterford, Muenster, Ireland by the time of his death on 17 September 1862. He was born there on 5 May 1840 to John and Catherine (Phelan) Clooney. In June 1860 he heeded the call of the Pope for military support against the nationalist forces in Italy, and by way of London, Paris, and Marseilles arrived in Italy and joined the Irish Brigade (Battalion) of about a thousand of his countrymen in the army of Pope Pius IX by August. At the corner of one of these streets, I received a slight wound in the arm from a spent ball. There will only be a slight mark. The men, nineteen in all, formed up to attempt to force a passage through to the fort when they were forced back by a fresh volley from the enemy … Our men now discharged at the enemy, killing and wounding many of them. We were now forced to divide. Six of our lads passed across the street and got under cover; twelve more turned across and wheeling by a small street, broke open a door where we endeavoured to protect ourselves till evening when we might join the whole company of Irish for a deadly fight. But some of the civilians sold us and in about an hour after entering the house we were surrounded by Piedmontese soldiers … [who] fired away at the windows and [blew] them in about our ears, while others poured volley after volley up the stairs and our lads were blowing down on them in return. They demanded a surrender. I feared that they might fire the house. I advanced and shook hands with a sergeant and so we made an honourable surrender. Of how we were treated I cannot speak now, as I am a prisoner. Along with the rest of the Irish Battalion, he was a prisoner of war at Genoa until released (or ransomed) in late October 1860. They returned in a body to Ireland by way of steamship to Marseilles and by train through Paris, and were feted in Cork and Dublin before going to their homes – Clooney to Waterford in mid-November. After hearing of the outbreak of the American Civil War in April 1861, Patrick Clooney again left Ireland and arrived in New York in June 1861. On 5 May the very Irish 69th New York State Militia Regiment had mustered for 90 days into Federal Service and decamped for Washington. 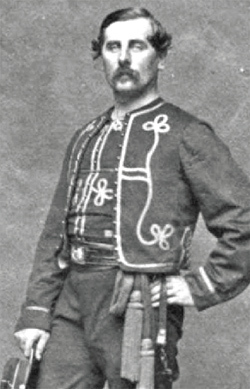 Fellow Waterford native Thomas F Meagher organized and commanded Company K – Meagher’s Zouaves – of the 69th. On arrival in the States, Clooney caught up with them in the field and enlisted as a Private in the Company. He was promoted to Sergeant in July, and was in action at First Bull Run on 21 July 1861 [Kelly report]. The unit mustered out shortly after the battle (3 August at NYC) when their term of service expired. In September, the Company became the nucleus of the new 88th Regiment of NY Volunteers then forming in New York City. It was apparently numbered in honor of the 88th Regiment of Foot (Connaught Rangers – “the Devil’s Own”), an Irish unit of the British Army in which some of the men had served. The 88th was assembled from the beginnings of two regiments originally organized by Colonels Baker and Meagher; it became Baker’s as Meagher was appointed Brigadier General of the new Irish Brigade made up of the 63rd, 69th and 88th New York Infantry regiments. Clooney enrolled in the 88th on 16 September and was commissioned Captain on 2 October – as he recruited and organized Company E. Father William Corby, late of Notre Dame (Indiana), joined the regiment as Chaplain on 15 December, and they left New York for Washington and service in the Army of the Potomac (AoP) on the 16th. They were in the defenses of Washington over the Winter of 1861-62, and deployed to the Peninsula in late March with the rest of the AoP. There the Brigade gained its fourth regiment – the 29th Massachusetts Infantry. The 88th took their first casualties on 21 May at White Oak Swamp, and were engaged heavily nearly continuously thereafter from Fair Oaks through the Seven Days (Gaines Mill, Savage Station, Glendale, Malvern Hill) into July. Although the Library of Congress doesn’t identify our man, two other online references do. The first I found was under a copy of the image hosted by the Collins 22 Society. They identify the officer as “Captain J.J. McCormack”, citing information from a curator of photographs at Notre Dame University. Although I found no one with that exact name in the Irish Brigade, I think they may be referring to James J McCormick of the 63rd New York Infantry. He was 2nd Lieutenant of Company D of the 63rd on the Peninsula. He was appointed Captain in late 1864, but did not muster at that rank. An alternate identification comes from an article about Clooney in Decies – the journal of the Waterford Archaeological and Historical Society – 2000 edition. In it, author Pat McCarthy identifies the man as Clooney based on notes from Irish historian/ACW specialist John Garland which ‘quoted’ WD O’Grady, a veteran of the 88th. Update 1/23: Joe Bilby in his Irish Brigade identifies the man at back right as James McCormick, later Quartermaster of the 63rd. The folks at Collins 22 labeled that person as Dr. K. O’Hanlon. The LoC 1977 notes list names (not seating) as: Lt. Phil. O’Hanlon, Chaplain Dillon, Chaplain Corly (sic), Lt. J. McCormick. 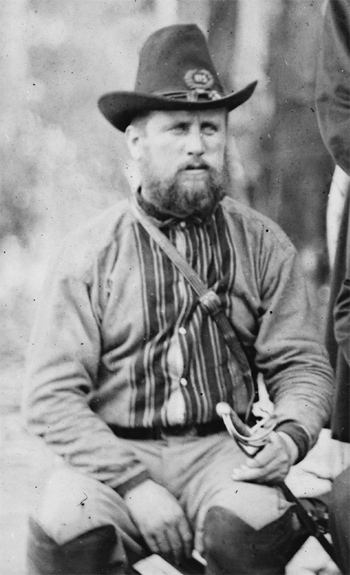 Philip O’Hanlon was original Quartermaster of the 63rd until discharged in August 1862. No smoking guns here, but some possibilities. I hope I’ll hear from more experts on this. After about a month of rest and refit in Washington, in early September 1862 the 88th New York and the rest of the Brigade set out on the Maryland Campaign. At the Battle of Antietam, in the van of General Israel Richardson’s Division in the Second Army Corps, the regiments of the Irish Brigade slammed into the Confederate Army center along the Sunken Road about 10:30 on the morning of 17 September 1862. The 88th New York, led by Lieutenant Colonel Patrick Kelly, was at the far left of the Brigade line [map] in the direct frontal assault on what’s now remembered as Bloody Lane. The fight was close and terrible. As an indication – the 88th lost 35 killed and 67 wounded of about 300 men present – more than one man in three struck down. The Confederates were later driven from their position in the Lane, but the Federal force in the Center was exhausted and made no further significant advance on that part of the field. The surviving troops of the Brigade remained on the field through the next day, and the Confederates withdrew across the Potomac back into Virginia on the night of the 18th – 19th. After a few words from Chaplain Corby, Patrick Clooney was buried on the field by his men, with a wooden marker over him. Because he had no family in the States, and probably left no money, the Regiment took up a collection and paid to remove his body from the field and rebury it in the Calvary Cemetery in New York. This was done on 18 October 1862. In 1863 his friends in Ireland funded and installed a monument to him in the Ballybricken Churchyard, Waterford. Men of the 69th New York Infantry laid a wreath at that monument on 16 September 1962: near the 100th anniversary of the Battle and Patrick Clooney’s death. Now here’s how modern day artist Brad Schmehl pictured Captain Clooney in his moment of glory at Antietam. I’d hoped to ask him about the painting and if he’d seen a photo of the Captain, but his email bounced. If anyone has a recent contact address, I’d appreciate having it. For details of Clooney’s home, early life, and Papal service I have relied mostly on Pat McCarthy’s Under two flags – the military career of Captain Patrick F. Clooney, Ballybrickenman in the journal Decies, Volume 56, Waterford; Waterford Archaeological and Historical Society, 2000 (published online in pdf). Mr McCarthy transcribed the quoted piece from Italy from the Citizen. His is also the best case I’ve seen for identifying Clooney in the Gardner photo of July 1862. 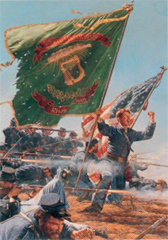 Joe (Joseph G.) Bilby’s The Irish Brigade in the Civil War, DeCapo Press edition, 1998. Originally published 1995 by Longstreet House as Remember Fontenoy! : the 69th New York and the Irish Brigade in the Civil War. I found the photo of Thomas Meagher as Captain, Meagher’s Zouaves (Co. K of the 69th NYSM), in the online collection of the US Army Heritage and Education Center (formerly known to me as USAMHI), Carlisle, PA. 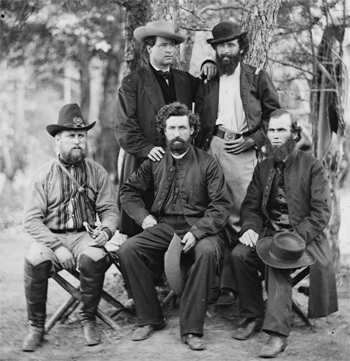 The photograph of the five men used here is titled Harrison’s Landing, Va. Group of the Irish Brigade, by Alexander Gardner, of July 1862. It is in the collection of the Library of Congress. The subjects are listed as “(back row) Patrick Dillon, unidentified; and (front row, left to right) unidentified, James Dillon, and William Corby. The identified men are priests of the Congregation of the Holy Cross, University of Notre Dame. (Source: E. Hogan, Univ. Notre Dame Archives, 2009)”. Clearly the two unidentified here are Army officers. On their image gallery page for the photo, member BM (Bill Martin?) of the (Michael) Collins 22 Society cites Stephen Moriarty as the source of identification. Mr Moriarity is/was the curator of photography at the Snite Museum, Notre Dame University. I did find a James J McCormick listed in the roster of the 63rd New York Infantry. Phisterer (Vol. III, pg. 2602) has him as mustering in 16 September 1861, age 26, as 2nd Lieutenant, Company D. Promoted 1st Lt and Quartermaster in August 1862. Appointed Captain in September 1864 before discharge in October 1864, but not mustered at that rank. Philip O’Hanlon, Jr. was original Quartermaster, 63rd NY. Discharged August 1862. Found no O’Hanlons as surgeon or assistant in the 63rd, 69th, 88th NY or 28th Mass regiments in either Phisterer or Conyngham. Jim Schmidt [blog] has used the same photograph on the cover of his new book Notre Dame and the Civil War: Marching Onward to Victory [Amazon listing]. Thanks to Jim for cluing me to some email correspondence going around on the picture. Details of Captain Clooney’s commissioned service are in the Roster of the 88th Infantry published by the NY Adjutant General in 1901, recently put online by the NY State Military Museum (NYSMM) and, more accessibly, in Phisterer’s New York in the war of the rebellion (1909-12), Vol. IV, pages 2980, 2983, with the Regiment’s Antietam casualties at page 2878. The dramatic narrative excerpt from Turner (pseudonym “Gallowglass”) used here is from ANTIETAM–THE DEAD OF THE BRIGADE and posted in full on the clippings page for the 88th from the NY State Military Museum. It was published in the Irish American newspaper of New York City, 18 October 1862, page 2. Go read the rest! Thanks to the folks at the Wild Geese Today (esp. Mike Kane, Ger Regan and Joe Gannon) who correlated the source and the author. 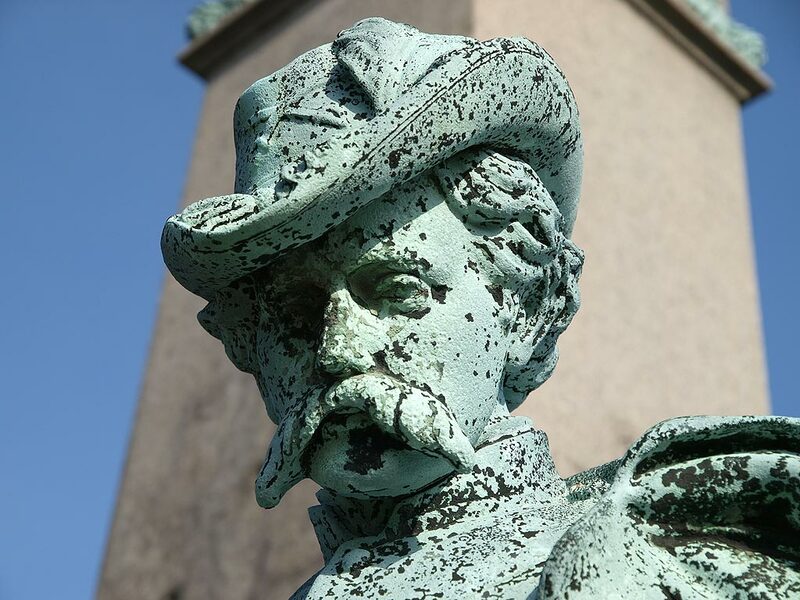 The Soldiers Monument within Calvary Veteran’s Park is itself in Queens (NY) Calvary – the nation’s largest cemetery. The photo at the top of the post is of part of a sculptured figure (1866, by Daniel Draddy) from the monument, found online in a piece posted 25 May 2009 on Bios Theoretikos; photographer not identified. James and I have actually been corresponding recently with regard to the possibility that Clooney is one of the men in the Harrison’s Landing photograph. It would be great to confirm it as him. Joseph Bilby in ‘The Irish Brigade in the Civil War’ has put forward that the officer standing at back right is James J. McCormick, Quartermaster of the 63rd New York, which if correct ‘frees up’ the man seated front left to be Clooney. As far as I know a lot of the O’Grady information may come from his pension records which could be where Garland got that information identifying the officer as Clooney. Clooney is being very modest in his letter of the fight at Perugia, 13 September 1860. G. F. Berkeley’s landmark study of the Papal War ?��Ǩ��� ?��Ǩ��The Irish battalion in the Papal army of 1860?��Ǩ�Ѣ – recounts eye-witness tales from Irish veterans where they mention Clooney as being “the bravest of the brave.” After the twenty Irishmen who had been ordered to guard an outlying gate realised that the fighting was going on a distance from where they were stationed, they fought their way back towards the invading Piedmontese enemy. It was Clooney who organised the final stand in an abandoned house and this small group of raw Irish recruits held out against hundreds of battle-hardened Italians. Over confidence was the Piedmontese initial mistake and they lost many a soldier attempting frontal assaults against the Irish ensconced on the first floor. The tipping point was the arrival of enemy artillery and, as Clooney points out, the fear that the dwelling was to be burned. Thanks Damian – I’ve updated for Joe’s identification, and a note about an O’Hanlon. I don’t know if this is getting clearer or muddier. And thank you, Robert, for that. He did seem rather casual about close combat, house to house. This photo was taken in the summer of 1862 at Harrison’s Landing, Virginia, by Alexander Gardner. Seated at the front left, is Captain Patrick Clooney, who died at Antietam in Sept 1862. Next to him is Fr. James Dillon, CSC (died in 1868) who is flanked on the right by Fr. William Corby, CSC. In the back row is the visiting Fr. Edmund (Edmond) Burke Kilroy, CSC (paymaster and informal chaplain of 35th Indiana Volunteers (1st Irish), and Colonel Patrick Kelly, who would lead the Irish Brigade (down to around 500-600 men following the slaughter at Maryre’s Heights in Fredericksburg in Dec 1862) at the Wheatfield on the 2nd day at Gettysburg following Corby’s Absolution. Kelly later died, shot through the head at Petersburg. Citation regarding the subjects in the photograph: Warren B. Armstrong in “For the Courageous and Fighting Dying Union Chaplains of the Civil War,” 1988, page 32. The priests were all Holy Cross Fathers (CSC) from Notre Dame. Correction…the Armstrong book was from 1988. In this picture, included in a book by Warren B. Armstrong (For the Courageous Fighting and Confident Dying Union Chaplains of the Civil War, 1998, page 32), Fr. Kilroy is listed as an unidentified visiting priest… Starting in the back from the left: Fr. Edmond Burke Kilroy and Colonel Patrick Kelly. In the front row from the left: Captain Clooney; Fr. Dillon; and Fr. William Corby. This picture was taken while Fr. Edmond Burke Kilroy was visiting the camp of the Army of the Potomac [Harrison’s Landing, VA, Summer 1862].